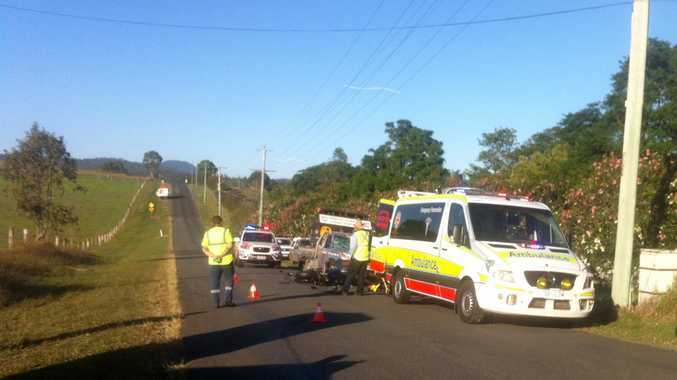 A MOTORCYCLIST has been airlifted to hospital with serious injuries after a head on collision with a ute in the Gold Coast Hinterland this morning. The man in his 30s sustained suspected multi-trauma injuries in the accident, which happened on Boyland Road in Boyland, west of Canungra. RACQ CareFlight Rescue's Gold Coast helicopter was tasked to the scene shortly after 7am with a Critical Care Doctor and Intensive Care Flight Paramedic on-board. RACQ CareFlight Rescue Aircrewman Ryan Purchase said the man tried to swerve to miss the ute. "He came off his motorbike and hit the ute's bonnet and windscreen," he said. The rider was transferred to Gold Coast University Hospital in a serious condition. RACQ CareFlight Rescue attended 291 primary missions last year, providing specialist air-medical care to seriously injured people across Queensland.